This is a common resident. It is about 8 1/2 inches long. The adult looks similar to the Brush Cuckoo. The Plaintive Cuckoo has buff colored underparts and the Brush Cuckoo has rufous colored underparts. 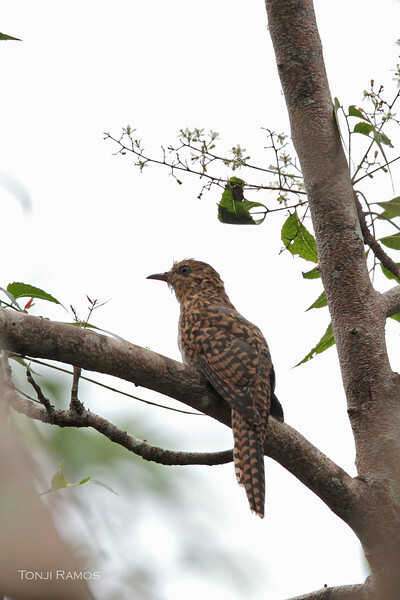 The immature Plaintive and Brush Cuckoos can be told apart by the central tail pattern. This bird has eluded us for some time. We have heard it in Laguna but have never seen it till our visit to Negros. Thankfully we got a nice long look. PLAINTIVE CUCKOO- immature Cacomantis merulinus Valencia, Negros Oriental, Philippines The pattern of central tail feather shows this is a Plaintive Cuckoo.